Interventions - 3&4: How will we respond when they don't learn? How will we respond when they already know it? What do we want our classrooms to look like for students and for us? What assessment practices will we use to enhance student learning? What does great instruction look like? What is our plan for intervening when students struggle? How can we extend and enrich our students' learning experience? What's keeping us from becoming the school we want to become? What is learning really all about? What is happening as the brain receives, organizes, stores, and retrieves information and develops ideas? Most children enter school with a growth mindset. Without the opportunity to correct, learning is likely to stop. We improve with multiple attempts. Effort and proper preparation are the main determinants of success. Reflect to learn (processing time). The brain is chunking, swirling, and searching for connections as we learn. Stressed brains do not learn the same way. We are natural problem solvers and explorers. People are wired differently with different experiences. We work harder and longer when we are internally motivated. Many of the presentations referred back to the work of John Hattie and Robert Marzano, looking at best practices for student learning. I want to do a lot of digging into this research over the coming school year. Tim showed us a video from comedian Michael Jr.'s series entitled Break Time. This YouTube video is the closest cut to what we saw at the conference. The big takeaway: "When you know your why, your what has greater impact because you are walking in and towards your purpose." I definitely will be showing the video to classes of mine moving forward and asking them the why of their presence. I also want to make sure I am explaining to my students the "how" of learning: neurons, dendrites, synapses. Tim referenced the work of other teachers in his presentation about growth mindset. "It is in there. It is possible." It made me think about an AMusEd podcast about Social Emotional Learning and how I could incorporate that into my classroom. This year, I felt I was better able to target my learning to things I or my PLC need. Specifically, I believe we need help in answering Question 3 and Question 4 of the Four Critical Questions of a PLC: How do we respond when they don't learn? How do we respond when they already know it? This particular breakout focused on making sure we were collecting meaningful data and ensuring we were focused on the results of that data. Paul took us through exercises that helped us identify whether certain data was meaningful to our position. One example he showed involved a school requiring PLCs to identify the essential skills from their first unit of study for the next year as part of their checkout process. The PLCs then created an assessment for those essential skills and gave it to the incoming class, informing their instruction for the next year! Of particular interest to me, and I would like to do some further research into it, was how Paul used data in his roll as a principal. His school worked to show correlations between how teachers' graded their students and how those students scored on standardized tests. They also looked at this data by sub-group, individual teachers, and individual class periods. This information is detailed in his book, How to Help Your School Thrive without Breaking the Bank. "A team of teachers must determine who on their team has the strongest evidence of learning, and, as a result, that teacher must be provided additional time and support within the professional day to re-teach students who did not learn the agreed upon essential learning targets to generate learning." THIS IS HUGE! And he spent most of the presentation unpacking it. an ongoing process in which educators work collaboratively in recurring cycles of collective inquiry and action research to achieve better results for the students they serve. PLCs operate under the assumption that they key to improve learning for students is continuous, job-embedded learning for educators. A process by which members of a team work interdependently to achieve a common goal and ensure that decisions made collectively are carried out independently. It makes me really looking forward to curriculum review to go through that process of identifying essential skills and developing common assessments. Are the decisions we are making right here, right now, what is best for our students or more convenient for us? Mike took us back through the Three Big Ideas of the PLC Process from Tim's Keynote to help us identify the things we must be tight about if we truly mean all students learning at high levels. Mike showed us that in the current economy, students need to have more than a high school education to be competitive. That means when they are with us, they need to be learning at grade level or better. How do we accomplish that? Work in collaborative teams and take collective responsibility for student learning rather than work in isolation. "Collaborative teacher teams are teams of educators whose classes share essential student learning outcomes. These teachers thus work collaboratively to ensure that their students master these critical standards." "Across the school, we should schedule frequent collaboration time during the contractual day for teams to collaborate." This collaboration time piece is key. On paper, it appears that our PLC (HS Band & Choir) has time to collaborate, when in actuality, we do not share essential student learning outcomes. Our dPLC (6-12 Band) does not have time to collaborate unless we do not teach lessons, depriving students of essential curriculum. Implement a guaranteed and viable curriculum, unit by unit. Marzano tells us that "creating a guaranteed, viable curriculum is the number-one factor for increased levels of learning." "Essential standards do not represent all you are going to teach. They represent the minimum a student must learn to reach high levels of learning." "Across the school, we should create a master schedule in which all students receive access to grade-level essential standards." "Across the school, we should identify essential academic and social behaviors." By identifying the essential curriculum, we can better answer Questions 2-4. These include academic and behavior standards. Are there currently structures in place that prevent all students from accessing our essential curriculum? onitor student learning through an ongoing assessment process that includes frequent, team-developed common formative assessments. "For skill interventions, you must get down to by student, by standard." uild the team's capacity to achieve its goals. Intervene or extend on behalf of students. "What students did or did not master specific essential standards?" "Which instruction practices did or did not work?" We must assume that "not all students learn the same way" and "not all students learn at the same speed." It does not matter which teacher your child has at our school, if your child needs extra time and support to learn at high levels, we guarantee he or she will receive it. All students must have access to grade-level essential standards. There must be a timely, systematic process to identify students who need extra help. Take place about every three weeks. There must be flexible time in the master schedule to provide supplemental interventions. Mike provided us with a few different resources from Pioneer Middle School where he was previously an administrator. Their Pyramid of Interventions is based off SolutionTree's RTI At Work Pyramid. Another resource was how Pioneer Middle School implemented the flexible time in their schedule. I think that if our teachers really brought into the collaboration process, they would love implementing something more than what our current Seminar provides once per week. Effort is not an option in our school. If you can not do it on your own, you will do it in front of us. This system of supports needs to be SCHOOL-WIDE, not individual teacher interventions. I originally planned on attending Great to Greater: PLC at Work in High-Performing Schools with Tim Stuart, but the emphasis throughout the other session on common assessments as part of the process led me to change my mind. Part of me wishes I had attended Tim's session instead. The focus is on student learning. Assessments are created and agreed on by teams. Results are collaboratively analyzed and acted on. Students and teachers receive immediate feedback. Students have multiple opportunities for success. This summer, we have been developing resource binders for our 6-8th grade students, and Tim's session tied right in. The beginning of his presentation focused on student ownership and student motivation through growth mindset. Because his presentation was not very linear, my notes may seem a little scatter-brained. I know you can do better because I have high expectations for you. What we're doing is important. You can do this. We are not going to give up on you. If the average effect-size of instructional practices is 0.4, we want to be utilizing practices that have higher effect sizes. We want teachers on teams addressing curriculum alignment, formative assessments, quality feedback, and interventions. Educators have an unwavering belief in the ability of all their students to achieve success, and they pass that belief on to others in overt and covert ways. Educators create policies and procedures and adopt practices that support their belief in the ability of every student. "involves an educator's own socialization and the impact of that socialization on his or her practice in the classroom, including expectations for student performance." "is the student's perception of his or her probability of success in school." Hattie found an effect size of 1.56 for Collective Teacher Efficacy, our belief that we can impact student learning. "institutional barriers in place that make the job of educating every student very difficult." 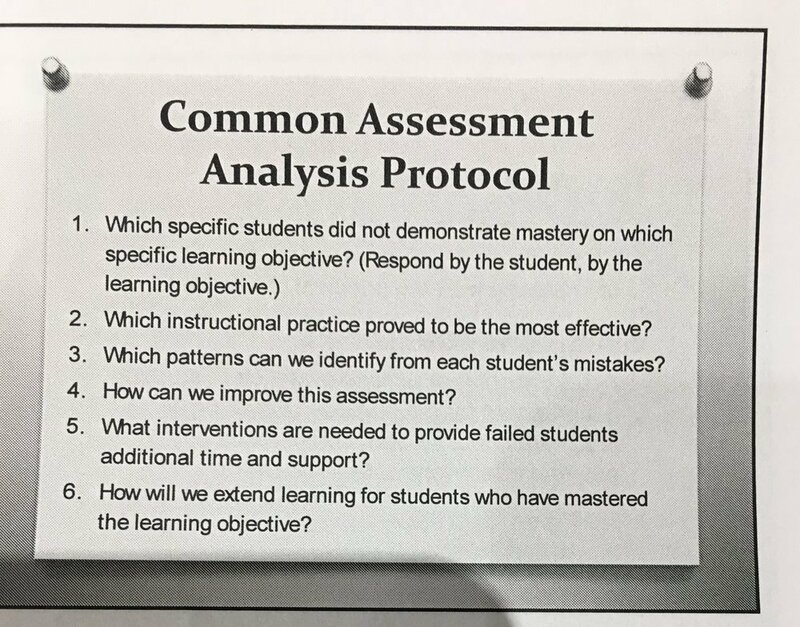 I believe the big next steps for my PLC are to develop common assessments. Over the previous four years, we have done the work of prioritizing standards, creating assessments, and analyzing data. What we have found is that we can't adequately respond because these assessments (I contend) are not common. We can't compare my 6th grade trombone assessments to the 6th grade flute assessments because the essential skills for each are not common. This might mean that we also have to do a better job of identifying the essential skills as well, but I am excited for these next steps in our journey. I believe the big next steps for my school are looking deeper into the flexible scheduling and system of interventions. I think that different PLCs within our building are implementing their own different means of addressing student concerns, but we need to be doing this school-wide. And the next steps for me as an individual? I want to dig more into Hattie, Marzano, and a few of the other resources from the institute (handouts from other breakout sessions, How to Help Your School Thrive without Breaking the Bank, It's All About Time: Planning Interventions and Extensions in Secondary School, How to Develop PLCs for Singletons and Small Schools). I want to implement some more teaching around brain research and growth mindset. I have several different specifics I want to see in our student binders and on the walls of my practice and rehearsal rooms. This conference was an excellent "boost" in the middle of the summer. I'm already looking forward to getting back in the classroom!